In devotional service there are certain activities which are called determined, such as fasting on certain days, like the eleventh day of the moon, Ekadasi, and on the appearance day of the Lord. All these rules and regulations are offered by the great acaryas for those who are actually interested in getting admission into the association of the Supreme Personality of Godhead in the transcendental world. 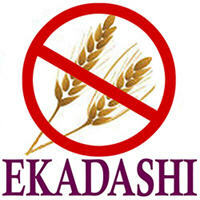 Ekadasi literally means “11th day”. Ekadasi occurs on the 11th day of both the bright and dark half of the lunar month. It is a day especially dedicated to the worship of Lord Krishna and as such devotees of Krishna and those aspiring for devotion follow this observance very carefully. The importance of the Ekadasi vrata was also given emphasis by Lord Chaitanya Himself. He once begged His own mother for a benediction and when she assented He asked to not take any grains on the day of Ekadasi and to observe it very carefully. Fasting on Ekadasi entails the avoidance of any kind of grain or legume: wheat, rice, etc., dahl, peas, bean type vegetables, mustard seeds, sesame seeds (except on Sat-tila Ekadasi, when sesame [tila] seeds may be offered and eaten), derivatives of these foods (wheat flour, mustard oil, soya bean oil etc. ), and food items containing these products. Additionally the devotees use this day to increase their devotional activities of hearing, and chanting and remembrance of Lord Krishna. Once when Srila Prabhupada was asked about how to observe the Ekadasi fast he replied very succinctly that one should hear and chant 24 hours on the day of Ekadasi. For more information on the local ekadasi fasting dates check out the Vaisnava Calendar.